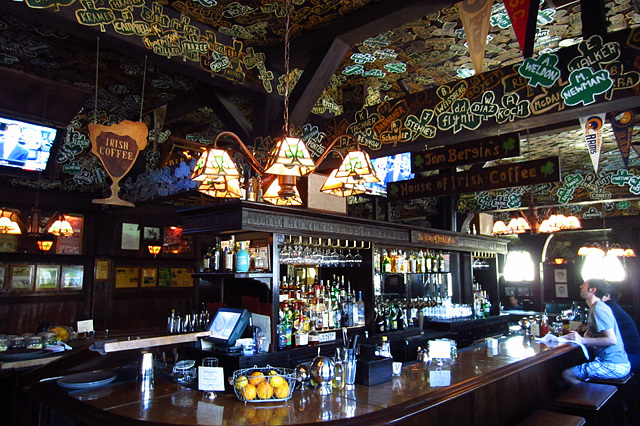 Founded in 1936 by a former lawyer turned publican, Tom Bergin’s is the oldest Irish establishment in Los Angeles, located at its present site on Fairfax Avenue since 1948. The tavern has welcomed locals and celebrities alike to its famed Horseshoe Bar, where Cary Grant and Bing Crosby were among the legendary regulars. 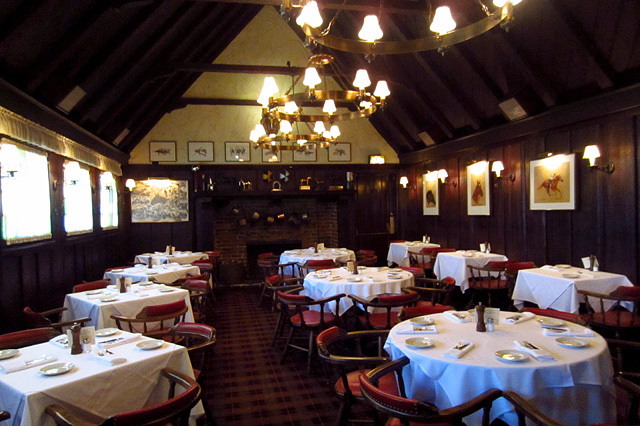 Tom Bergin’s is currently owned by partners Warren Ebbink and Brandon Boudet, who had previously acquired and completed an extensive renovation of Dominick’s in 2004. 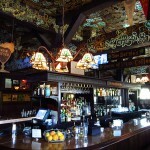 For the Tom Bergin’s interior, Ebbink and Boudet (who also own Little Dom’s and 101 Coffee Shop) implemented an update that was more cosmetic, restoring the Horseshoe Bar, shamrock-covered ceilings and wood-paneled décor, while still maintaining the integrity of the Mid-Wilshire landmark. The changes to the food and drink menus were more substantial, with chef Boudet bringing a local, farmers market sensibility to a contemporary menu that respects Tom Bergin’s roots while giving a nod to Ireland’s dynamic restaurant scene. To match the modern Irish fare, Ebbink and Boudet brought Marcos Tello and Aidan Demarest on board to revamp the cocktail menu and spirits list. While the iconic Tom Bergin’s Irish Coffee remains sacrosanct, the cocktail menu now includes signatures like the Macushla Manhattan (Black Bush, Benedictine, Lillet Blonde, Angostura, lemon peel); Cooper Union (Redbreast, St. Germain, Islay Scotch, orange bitters); and the Sheridan Special, a cold press version of the Irish Coffee, featuring Bushmills and Galliano Ristretto, stirred over ice and layered with hand-whipped cream. The Irish whiskey list is now one of the best in the country, with selections ranging from Danny Boy Irish Whiskey and Michael Collins to Hennessy Na Geanna and Knappogue 36 Year Pot Still. Earlier this summer, Tom Bergin’s debuted its first-ever weekend brunch menu, which is served on Saturdays and Sundays from 10am to 4pm. I had enjoyed drinks at Tom Bergin’s on several occasions since its reopening this past spring, but a recent hosted brunch would be the first time I had a proper sit-down meal there. 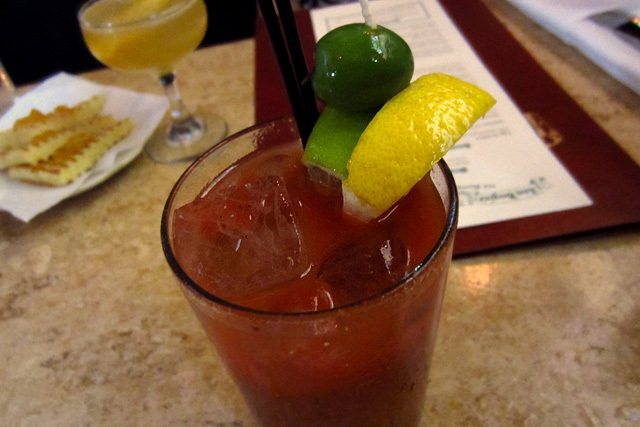 It wouldn’t be a brunch without a Bloody Mary, and the Tom Bergin’s version brings some heat along with a Guinness float, which lends a nice depth to the brunch stand-by. 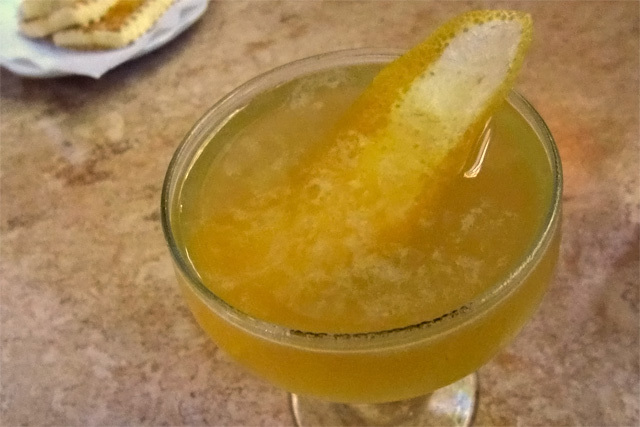 Besides the regular cocktail menu, another option is the Breakfast Cocktail, a Tello creation inspired by Salvatore Calabrese’s modern classic, the Breakfast Martini: Bushmills Irish Whiskey, house curaçao, fresh lemon juice, and a barspoon of orange marmalade. 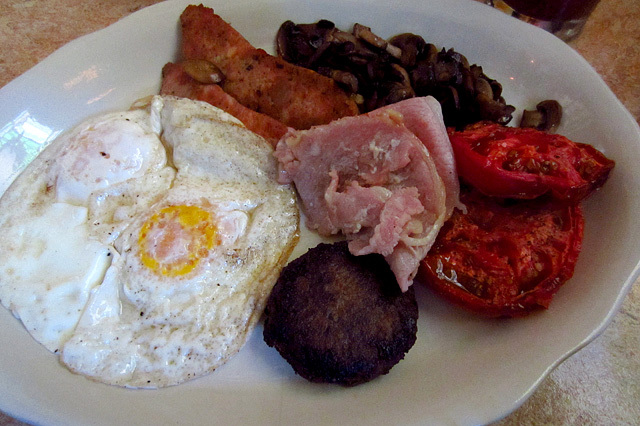 While other entrees on the brunch menu were tempting, there was no doubt that I’d have the Irish Breakfast ($16): two fried eggs, chicken sausage, rashers, roasted tomato and sauteed mushrooms, served with black pudding and grilled soda bread. A hearty way to start a quiet Sunday to be sure, and food coma aside it’s an ideal brunch menu, especially for those who may have overindulged the night before. 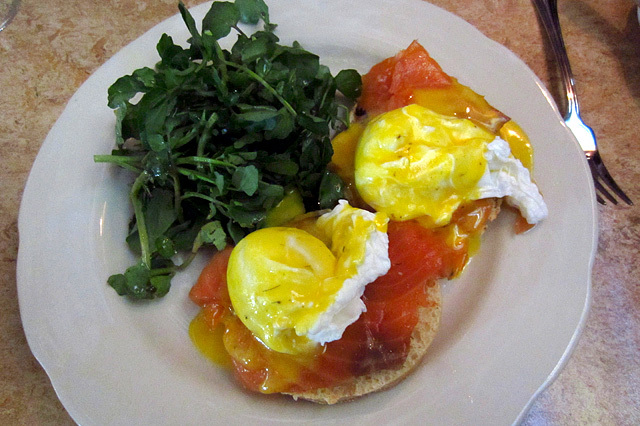 Smoked Salmon and Eggs ($15): two poached eggs served with house-smoked salmon on a toasted English Muffin, topped with dill pollen Hollandaise. Of course, brunch had to end with the classic Irish Coffee, made with fresh coffee, Bushmills Irish Whiskey, demerara sugar and cream. 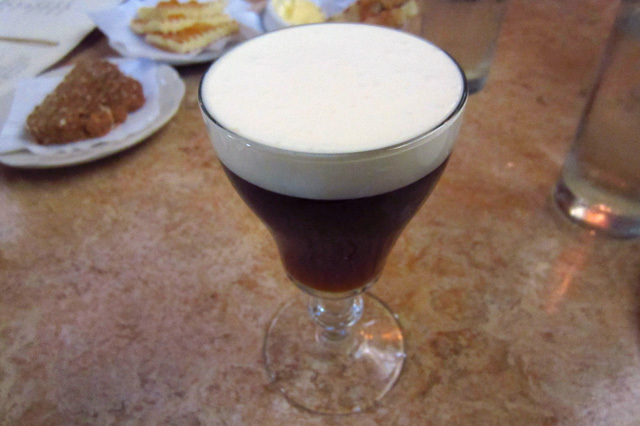 As quintessential an LA cocktail in its own way as a Martini at Musso & Frank Grill, the Tom Bergin’s Irish Coffee is a bucket list cocktail that warms your soul like a comfortable blanket on a cloudy day. And with autumn rapidly approaching, those days will be here before you know it.